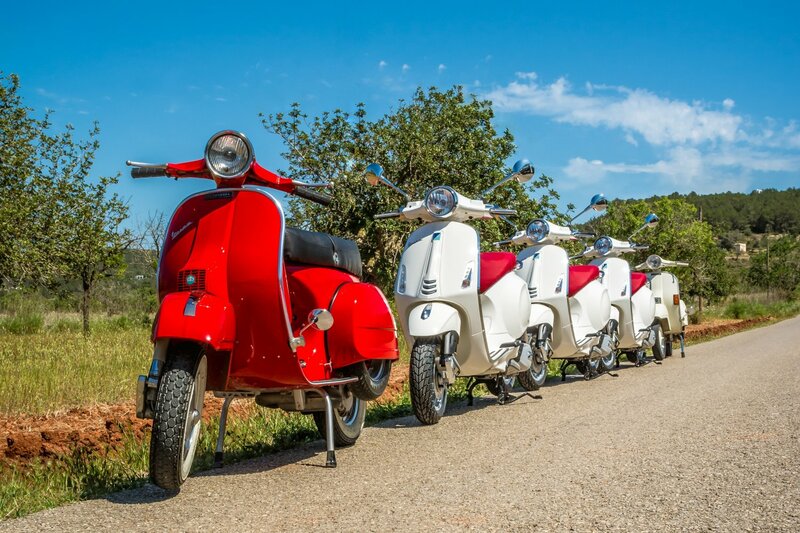 A four hour guided tour on a classic Vespa scooter will take you off the beaten track and show you the sleepy countryside and villages of the real Ibiza. Get out into the beautiful countryside of Ibiza with its pine clad hills, herb scented fields and sudden spectacular sea views and ride its quiet lanes courtesy of a guided tour on a classic Vespa scooter. Each morning and afternoon there are 4 hour tours through some of the island's most beautiful scenery with an experienced and knowledgeable guide who'll tell you about the wildlife, plants and history of the area. The route takes in country lanes, old villages and settlements and includes pit stops for swimming in the cool clear seas at Punta Galera or Cala Salada and an ice cream or refreshing drink. Riders, who must have a driving license, can choose between a Vespa with gears or an automatic, depending on their experience. Everything is included in the hire price; petrol, insurance and helmet. Refundable deposit: on pick up you are due to pay a refundable deposit of 150 €. This amount will be returned to you if the vehicle is returned with no damages. Transfer service from and to your accommodation is available with extra charge.